Title: Who's Been Sleeping In My Grave? Synopsis: The issue opens with a prologue showing a group of thugs interring a coffin with Luke Cage's name on it in a sinister moonlight burial at a cemetery in Queens. "So, rest in peace----Sucker!" quips a shadowy figure. 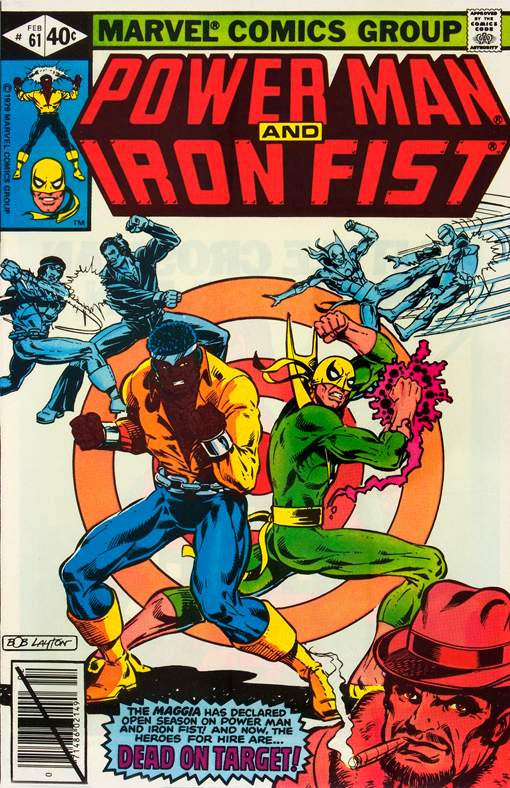 In the present, Big Ben Donovan stumbles through the door of Heroes for Hire, surprising Luke Cage in the middle of a phone conversation with Danny Rand when his old friend collapses on the floor. Ben tells Luke that he's on the run from Maggia just as a pair of gun-toting mobsters burst through the door. Luke makes quick work of them and then attends to Ben while he reminisces about their history. Man Mountain Marko enters the office and eventually manages to overcome Luke after shocking him with 220-volt wiring from the wall. From a rooftop across the street, Thunderbolt has been watching the fight and runs down to the street when he sees Iron Fist arrive in a taxi. The two heroes fight briefly and then agree to team up to track down the Maggia attorney Caesar Cicero who is responsible for capturing Ben and Luke. The two heroes go to the police station to look for information on Cicero. Thunderbolt tells Iron First his origin, revealing that the experimental treatment that gave him super speed is also aging him at an accelerated rate. The 28 year-old Thunderbolt resolves to nail the man responsible for his brother's murder before he dies of old age! To be continued next issue in "It's Your Funeral!"